What would you do for freedom? In Iron Grip: Warlord, the nomadic civilization of Atelia is being swallowed by the massive Confederation. It's a hopeless and tiresome battle; for every enemy Confederate that falls, five more takes their place. Outnumbered and forced to retreat into the heart of cities, a full-out urban warfare has begun that the Atelians will surely lose. As the vestiges of your world crumble and your morale sinks, the only hope for the future is you and your fellow warlords. This is your last stand. This is your freedom. This is your game. New artwork taken from Iron Grip: Warlord - "Survival Preparation" by Peter Johnston. This artwork is taken from Iron Grip: Warlord itself - the game will include cut-scenes, in which illustrations like these will help to carry the story. In addition there has been a decision to do a rendering overhaul, in order to make the game look more up-to-date. This has pushed back the release date, but we'll be seeing a dramatic improvement in the way the game looks. Oh and the improvement on the rendering engine sounds good to me. Higher polycount? Bump Mapping? Virtual Displacement?? More? Either way it sounds good! I'd be happier with just a few more polies and higher resolution textures. 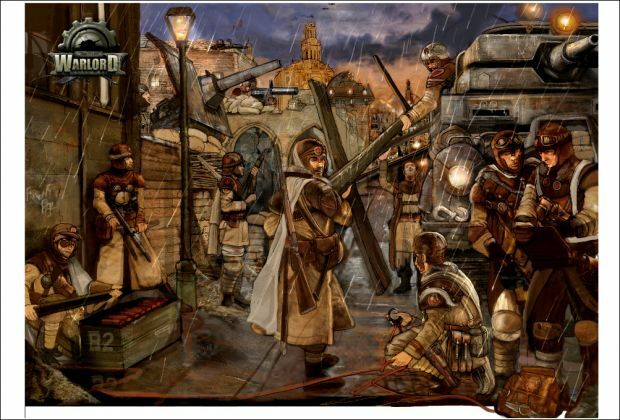 I like the "steampunk" art style and weapon designs. It seems like this mod is aiming for universal compatibility so it can be played on just about any machine. Ultra high quality shaders are secondary then, IMO, and something that can be an optional patch in. My card *can* support Shader 3.0, but chokes and sputters on TF2 with all high settings. the picture looks really good!! well done!! Fantastic, professional concept art. Now, can your modelers and mapper match it? Tell your artist his B2 reflection is wrong. And what's the point of showing this with all that white space and border around? It doesn't really serve any purpose even in the context of it being used in a cutscene. Rendering overhaul? Sounds good to me. Just as long as it doesn't push the release back too, too much, I'm sure you've thought long and hard about it, anyways.